Tony Geraci is director nutrition services for public schools in Memphis, where he provides healthy food for students. In the new documentary “Cafeteria Man,” Baltimore public schools food service manager Tony Geraci explains to a group of cafeteria workers that he spends most of his time “being a bureaucrat in an office.” But the film also shows Geraci working alongside students in a new 33-acre urban farm, accompanying a group of kids to testify before a congressional committee, and giving elementary pupils their first taste of a melon they helped plant and grow. “Cafeteria Man” documents changes in Baltimore schools during Geraci’s 2008-11 tenure, which began with building a central kitchen to replace pre-plated, processed meals with freshly prepared food made with locally grown ingredients. In the 83,000-student urban school district, says Geraci, “this has never been done, but it makes sense.” Many elements of the Baltimore program — school gardens, student-designed meals, and nutrition education in classrooms — have become a model for other districts. Geraci now directs nutrition services for the public schools in Memphis, and was in Boston last week for the annual meeting of the School Nutrition Association. 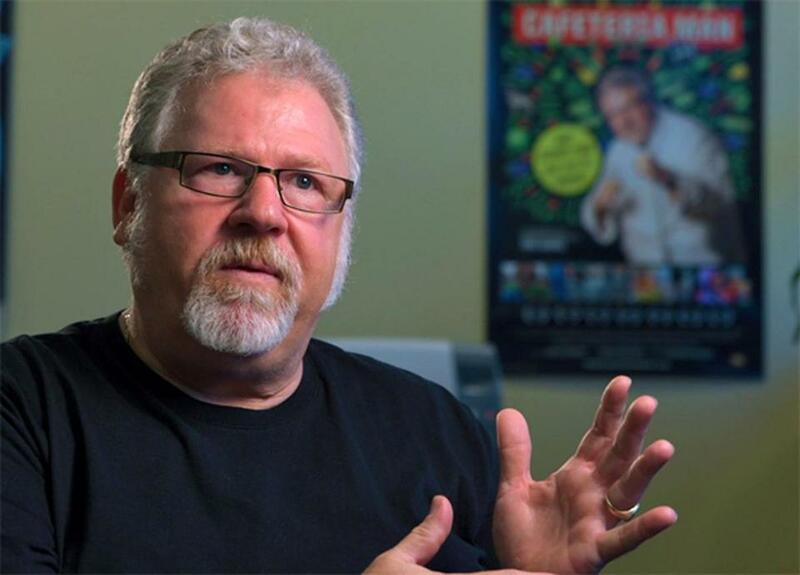 “Cafeteria Man” will air on public television stations beginning in late summer. Q. What kinds of challenges do school food service departments face today? A. I don’t think the average person understands that childhood nutrition is the most regulated industry on the planet. I see health issues all the time. I’ve got 8-year-old kids with type 2 diabetes. Our program in Memphis is about putting a healthy kid in front of an educator that’s ready to learn. We view our job more about readiness and less about the food on the tray. 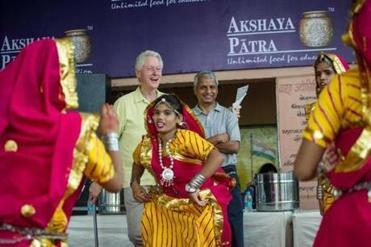 Andover’s Gururaj Deshpande joined former president Bill Clinton in India to meet students fed by Akshaya Patra kitchens. A. Our entire district next year will be the largest in the mid-South and one of the largest in the country that has a universal no-charge system for breakfast, lunch, and supper for kids who are staying after school. For every kid, every day. I think that’s the best program the USDA has rolled out since its inception because it completely eliminates the stigma around food. And it redirects the focus of the business to feeding children. Q. How does that translate into how and what you cook? A. Over the last 30 years, cafeterias started to look more like 7-Elevens than they do like cafeterias. They sell a lot of crap because kids want crap. It’s a revenue driver and it’s easy. We’re focusing our efforts in more of a scratch-food approach. I don’t buy chicken nuggets. I buy chicken and roast it. Q. Are federal regulations also changing school food? A. The model that the Fed laid out is really simple. Imagine a plate where 20 percent is covered with whole grains and 20 percent is covered with protein, whether it’s plant-based or animal-based. The balance of the plate is supposed to be fresh fruits and vegetables. Follow that guideline and you’re going to be fine. But I cook. Districts that don’t or can’t cook have to purchase their food pre-prepared. The majority of pre-prepared foods are full of sodium, corn syrup, or breading. Q. The meat industry did not react positively to your early adoption of Meatless Monday. A. It was never about not having meat. It was more about showing kids some alternatives, other foods that they may or may not be familiar with. The meat industry got crazy over it. The Nebraska Beef Council actually sent a cowboy to my office — chaps, bandanna, the whole deal — to call me out. I said, “Why don’t you come to my farm that I just built and I’ll tell you what my vision is and what I want to do.” To his credit, he joined me there. We spent the afternoon and he had his own little epiphany. He said, “This was never about meat.” He was a syndicated writer and radio host who did a really complimentary piece on what were doing. Q. You mentioned readiness as the goal. Are you seeing results? A. Food is one of the tools that ensures that kids are going to learn. Kids who are hungry do not learn. In Memphis I launched 96 schools doing breakfast in the classroom last year. Test scores were universally higher in those classrooms by 5 to 7 percent. The numbers don’t lie. Q. Do you continue to grow some of your own food in Memphis? A. We’ve put in school gardens for the last three years. We’ve built an urban farm right at my central kitchen in the heart of Memphis, where we literally grow food on the property and it gets processed and served to kids. It was built by kids. It’s run by kids and it’s being served to kids. Last year, we grew almost $1 million worth of our own stuff. That serves everybody. Interview was edited and condensed. Michael Floreak can be reached at michaelfloreak@gmail.com.